Panamax customer service skills.I spoke to maryann about return of unit.She wanted me to upgrade again.I said no.She didn't state that I will have to pay return shipping also when I returned defective 5100.Move on to other companies. Last of the lifetime warranty protectors.The 1500 is everything the others reviewers are stating.The newer unit 5100 isn't.Both of the upgrade units stopped working.When you return unit under warranty you must pay shipping back and forth in my case $42.00.Panamax does't state this anywhere. All panamax.Soon to be brick audio with a real ten year warranty. -Clean front panel -Shallow depth leaves room for plugs in cabinet. -Still works after several years. -Handled power "issues" in the neighborhood without incident. -Nothing connected to it ever failed. -Nice solid build quality. It isn't as showy as the Monster but doesn't feel like a cheap-O either. -It cost $200+ for a 10 outlet powerstrip with an aluminum faceplate. -The ON/OFF button is recessed into the faceplate and can leave doubt if you successfully shut it off. -Doesn't "ring the bell" aesthetically. Now fancy, backlit, voltage or current flow meters to Wow the neighbors. I bought this for a small secondary system that my father has set up in front of his La-Z-Boy chair and it served in that capacity well for about four years. I recently broke down the system and rebuilt it without a component type surge protector and decided that it was time that I wrote a review of this product. I also have the Monster 5000 unit and it, in contrast to the Panamax, has a bulk and ostentatious feeling quality to it that is appealing when you look it over. 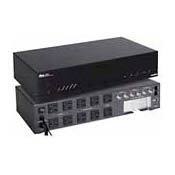 However, the tremendous depth of the Monster can lead to conflicts with power cables in the back of a rack. So the relatively shallow depth of this Panamax 1500 unit is a blessing. Its filtration properties, inprovements on video preformance and other such attributes will be left to the "audiophile/videophile" contingent. It worked when I installed it. Nothing plugged into in ever failed (and we had some power problems over that time too} And when I moved it on to another system it continues to work. So I am satisfied. However, think these glorified powerstrips in component shape are mostly aesthetical anyway. I figure it is better than having two six plug strips laying on the floor or shelf of a rack. Monster Power 5000 Panamax Max 5510 ( with glowing meters and brushed silver faceplate--awful pretty!) Home Depot El cheap-o fused power strip. Works as advertised, well built, not ridiculously expensive. When I hookedup the Panamax 1500 I was amazed. I thought I had a pretty quiet system, and good cable tv reception. But the difference was not subtle! The sound was noticeably cleaner immediately. My wife called out from the next room "Wow! The music sounds great!" TV was already good and not really improved, though TV sound was. VCR picture was better--clearer, less grainy. I also liked the build quality--a solid piece of equipment. I got the best improvement of all when I listened to music on digital cable, probably because both the AC power and the cable were filtered. A friend listened and walked over to the phone and ordered one after ten minutes. A great product! It really works! All the power Hiss sound is gone !!! and before this Max 1500 ~~ when I turned on my Amp, I got a loud thud when it kicked on - Power up and that is GONE so I love that. I thought this unit was over kill for me, But am verrrry happy I got it. background hiss on my system. A notable difference. This is a review of my Panamax 1500 surge protector/line conditioner. The Max 1500 protects your cable line,telephone line,satellite line and 10 outlets (4 always on,4 switched by the master on/off button and 2 delayed)i wish that it had 8 always on and 2 delayed so i could turn off the unit from time to time,but i cant.....i dont want to risk losing all of my settings on my A/V equipment. So yes its been on for over a year now.......and has ran ice cold, no joke. and to top it off its not even out in the open, it has A/V equipment above and below it,so if heat is a factor/issue in your set up, then the 1500 could help. I dont recall where i picked this unit up at,but i only paid around $200 for it witch isnt that bad...at the time the list price was $500 i think? the 1st thing i did when it arrived is to test every outlet in the house to see if they were working/wired properly. I found that 3 of the outlets were bad. 1 was wired wrong, and 2 were not grounded properly :NOTE the house i live in right now im just renting: and the wire in this place is older that dirt! that is mainly why i got the Max 1500,that and i live in a high prone thunder storm state......ive had countless power outages/surges, lighting strikes....4 houses away! and the unit has never failed me or my A/v gear once. So as a surge protecter it works great......now on to the Line conditioner part. Ive read and heard alot about this hole line conditioner thig, on how it makes wine from water....or how its just BS. but' what it has done for me (when i had cable) it was like.......OH....thats what cable looks like..hmm i didnt know?!?!? so if you have cable and a problem with lines,ghosting,or a fuzzy picture this may help you. but now i have a dish and (couldnt go back to cable if you paid me) i dont see that much of a diffrence with or with out the Max 1500......as for the over all sound?. i dont think it did much to it.. maybe alittle something just not quite sure what. and last but not least.......the dimmer switch....why on the back? why not the front? and to dim or undim,you need a phillips screwdriver,not ever a small knob.i dont lose sleep over it but' thats the only thing that bugs me. DSS cable and telephone connections, 10 outlets, voltage indicator lites. I purchased this unit new, in the box at Hi-Fi Buys during a clearance sale. They were changing over to the Monster power centers and were dumping all the Panamax rack mounted units. It sat in the closet for several months with my other components while we renovated our den. When we connected it, we noticed a significant increase in the picture quality from our cable TV. Since then, we have switched over to DirecTV. I was very pleased that the Max 1500 has the DSS cable and telephone connections which the Max 1000+ does not. The unit comes with ten AC outlets, four on all the time, four switched, and two delayed. It also has a trigger that can be plugged into a switched outlet on a receiver or other equipment to allow the Max 1500 to be remote controlled. I leave the unit on all time and don't use the trigger, so all ten outlets are always on. I have a Sony DSS receiver, A/V receiver, Betamax, VHS, CD player, tape deck, turn table, and TV all plugged in and never noticed the unit feeling even warm. As mentioned above, the picture quality on the cable TV improved noticeably when the Max 1500 was first connected. The audio components were hooked up later but we used new interconnects and speaker wires so everything sounds better, but I don't know what impact the Max 1500 made. The unit does what it is supposed to do, looks good, and I have the peace of mind knowing that my A/V gear is protected from surges from any direction. Somebody was thinking when they designed this. Five stars.